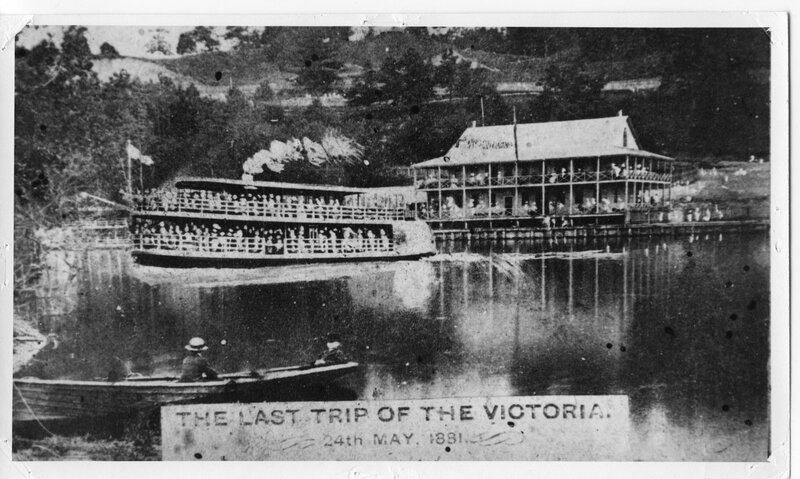 A black and white photograph showing an artistic depiction of the passenger boat, the Victoria, leaving Springbank Park on its last voyage which ended in the tragic drowning of nearly 200. In the left foreground two people sit in a rowboat looking towards the Victoria which is steaming away from the dock on the opposite shore. Many people are standing on the two tiered pavillion and on the bank watching. To the left of the Victoria, in the background can be seen part of another passenger boat. Originally published in Maclean’s Magazine, May 28, 1955. Almost Every Home In London, Ontario, Was Draped In Mourning When The Bodies Of a Hundred And Eighty-One Victoria Day Excursionists Formed The Final Link In An Incredible Chain Of Blundering Irresponsibility. on the Thames River near London, Ontario, crowded with more than six hundred exuberant excursionists. Suddenly, something happened. From his seat in a racing skiff less than a hundred yards off the VICTORIA’s starboard bow, Harry Nicholls watched the boat wallow toward London. He saw her rock ponderously from side to side responding to the motion of the upper-deck passengers who were running from rail to rail. The unusual swaying did not startle Nicholls who was aware of the VICTORIA’s shallow draft, but as he watched he saw the rocking increase until inches of water were shipped at each swing. Suddenly, with a roar of hissing steam, the boat’s huge boiler broke loose from its mounting and crashed through the bulwarks. Water poured through the opening and Nicholls was enwrapped in a cloud of live steam. With a slow, almost deliberate, movement the VICTORIA settled on her side. From both decks passengers were catapulted into the river. Nicholls heard the muffled screams of those trapped between decks. His slim shell was almost swamped in the wake as the VICTORIA went down. At least a hundred and eighty-one persons drowned on the May 24 excursion; of these, a hundred and ten were children. It was the blackest day in London’s history, the result of an almost incredible series of blunders that could easily have been averted. By nightfall the flags that bedecked London homes and businesses to mark the Queen’s birthday were lowered to half-mast. For eight days afterward, the dead who had been hooked from the river were carried to their graves. Funeral directors started work before dawn and were still conducting services long after dark. The supply of coffins in London was exhausted the first day and one infant was buried in an adult casket. All London’s nineteen thousand residents lost relatives or friends. One family, the Fryers, lost five members. By official decree a black armband became a Londoner’s badge of mourning for a thirty-day period. Business firms and schools closed for two days. Most homes in the city were draped in mourning. One milliner advertised in the London Advertiser: “Family mournings at A. B. Powell and Co. who are showing a large range of crapes and mourning-dress material. Our prices are low. Millinery orders executed at the shortest possible notice. Also dressmaking orders.” Draymen charged double their usual funeral rates. Here’s another example of why a good scanner matters. Tack this on as an addition to my earlier post. 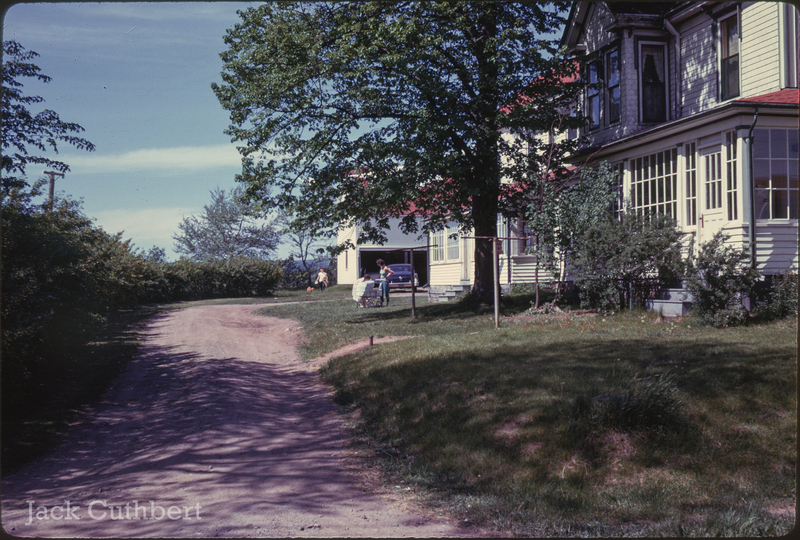 In addition to scanning my own film (rescanning, I guess) and my Dads, I’ve been rescanning slides taken by my great-uncle Jack Cuthbert. He was in the Air Force, and did a bit of travelling. Luckily, he took a camera with him when he did, and shot on Kodachrome transparencies. Most of them (if not all) are from the early 1960’s. 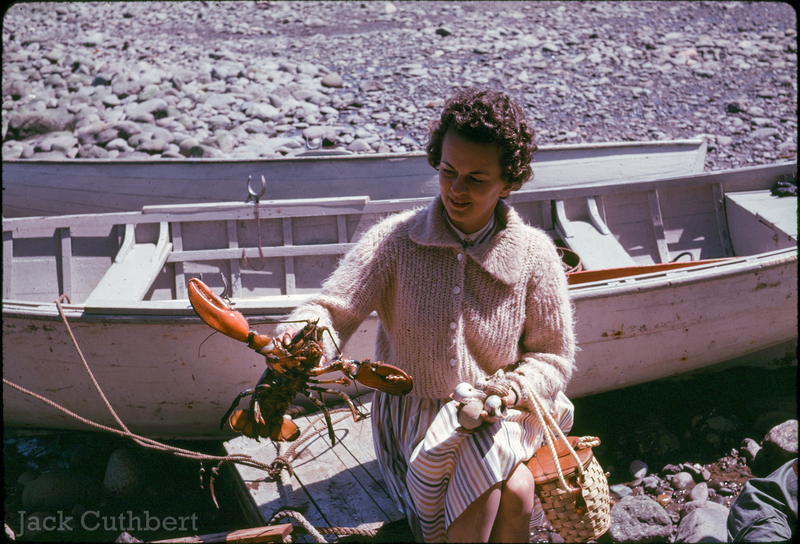 This one in particular, was taken in Nova Scotia in 1961. The top photo shows the slide as it was scanned with my old Minolta Dual Scan II scanner, while the bottom is from by my newer Plustek. Click for larger! I’ve tried to edit them in similar ways in terms of brightness and contrast. If you flip back and forth between the two, you can see major differences in how certain colours are picked up by the scanner, and how each scanner handles dark shadows and strong highlights. 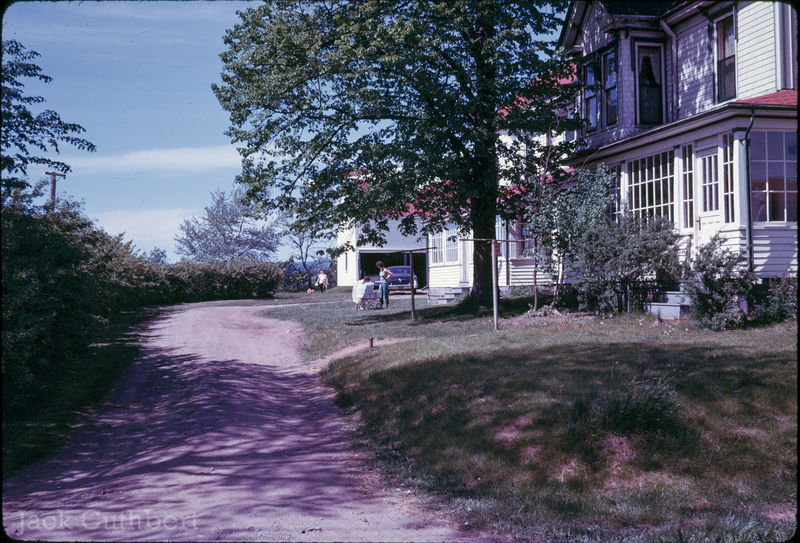 Here’s another example, also scanned from Kodachrome slides taken in 1961. ..was just one photo of a few, taken by Toronto Star photog Lucas Oleniuk on June 21, 2013. Toronto Mayor Rob Ford held a press conference at City Hall Friday afternoon in response to possible provincial funding cuts to the city. About a month after Jayden and I finished our WABCDEFG News assignment, I still had a ton of sound effects on my computer that I had assembled for the piece. And since I was finished school for the summer, what better way was there to spend time, than to cut together a bunch of them and make a funny voicemail greeting? In May 2013, this was, for about a week or two, the greeting on my answering machine. Recorded over Skype, so the quality is a bit iffy. The number of alternate takes Jayden and I recorded for our WABCDEFG News radio piece is mind-boggling. With the extra time I’ve had lately, I’ve been digging through old files to find stuff to post here. I managed to find Jayden’s original read of the “Talking While On A Cell Phone” segment, which in the final piece was voiced by me. He decided to channel Al Pacino, as you can hear in the clip below. Here is how the piece sounded in the final mix. To listen to the whole thing, click here!